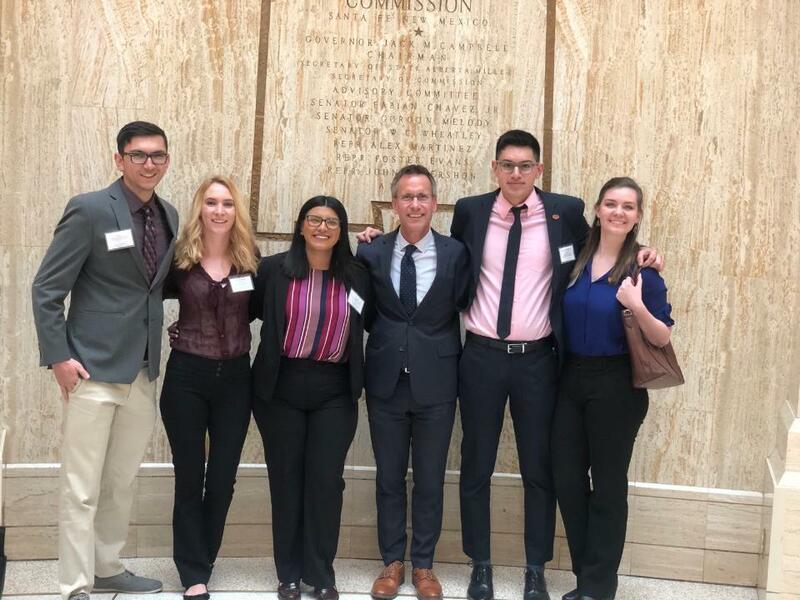 Photo: Department Chair and Professor, Tim Krebs, with the 2019 NM State Legislative interns. Selected interns will be in a unique position to observe, first-hand, the operation of the legislature. Participants in the program will be assigned to members of the New Mexico State Legislature for one week during the 2019 legislative session. The intern reports at 9:00 a.m. on Monday morning of their assigned week, works full-time, and resides in Santa Fe until released at the close of the week's legislative session. Interns receive a stipend of $500 to help cover their expenses. Preparation for the internship includes a full-day of orientation in Santa Fe. Interns must register for one hour of academic credit. They are required to submit daily journals and a short summary paper to the internship coordinator. Upon the completion of the internship and the fulfillment of these requirements, interns will be assigned a grade of credit (CR) or no credit (NC). Any questions about the program should be directed to Professor Timothy Krebs at tbkrebs@unm.edu. To apply, submit the following materials as a complete packet to the Department of Political Science, Attn: Steven Romero, Room 2061, Social Sciences Building, no later than 5:00 p.m. on Thursday, November 16th, 2018. All applications must be typed. Two information meeting sessions will be held in the Political Science Department. Please attend if you have questions and would like to learn more about this internship.